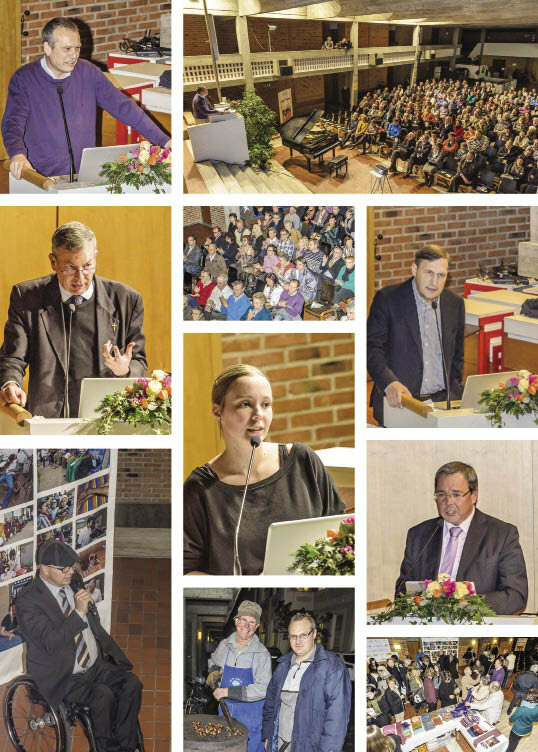 More than 200 guests attended our 10-year anniversary celebrations in the Cusanus Akademie in Brixen. The mayor of Brixen, Mr. Albert Pürgstaller welcomed the guests. Helmuth Wolf and Raimund Ausserhofer, longtime members and school adopters, explained about their experience with this direct form of help. Klaus Zoderer (20) from Schlanders told everyone about his unforgettable experience working as a volunteer for us in Mae Sot. Pictures and video clips to sum up the ten years were also shown. It would have been impossible for us to organize this event from our own budget, therefore we would like to thank the following companies for their support: Weingut Alois Lageder, Clementi Elektro OHG, Faro Shopping, Restaurant Finsterwirt, Brauerei Forst, Gemeinde Brixen, Restaurant Grissino, Gasthof Haller, Hotel Hochrain, Interhotel, Microtec, OBI Baumärkte, Stuefer Bau GmbH, Tischlerei Oberhuber, Konditorei Pupp, Plose Quelle, Backstube Profanter, Metzgerei Schanung, Restaurant Traubenwirt, Weissenhof, Gardencenter Winkler, Zotter Schokoladen Manufaktur. A special thanks goes to Mrs. Elisa Wallnöfer for the musical entertainment, to Mr. Martin Mayr for the good chestnuts and to Mr. Georg Hofer for the pictures. To celebrate our 10-year anniversary the students from the Franziskanergymnasium in Bozen organized a charity concert “Rock no Border.’ 300 people attended, 8 bands with more than 40 musicians played for Help without Frontiers. Our projects were presented during the breaks. More than 1.200 Euros were collected during this event. Benno Röggla was guest in the Dolomiten magazine’s “Sonntagsfrühstück” and the Radio station “Südtirol 1”. He was also elected “head of the week” by the “Tageszeitung” newspaper. The Kiwanis Club Meran awarded Benno Röggla the prize for humanity (Preis für Menschlichkeit) which also came with a 10.000 Euro donation. It was a positive surprise for us that the South Tyrolean weekly magazine FF gave Benno Röggla third place in the category of Society, after Markus Lanz and Reinhold Messner. We have been guests at 44 events, had 27 presentations and reached 6.630 people. We gave 11 presentations in different schools in South Tyrol, as well as at the Kiwanis Club Meran, the “Think more about” congress in Brixen, at the SSV Taufers sports competition, the Pfadfinder in Taufers and the Mütterrunde in Brixen. In total we earned nearly 4.050 Euro for our administration and received nearly 70.700 Euro donations during those events. The winery Lageder collected money for us during their wine fairs „Summa 2012“ and „Vin-O-Ton“. This money is to go towards the school adoption of New Day School and part of the Rays of Youth music project. During these events a total of around 35.300 Euro were collected. Under this motto 43 South Tyrolean companies contributed to our ‘meals for schools’ project. During the Christmas period various companies gave a specified amount from a certain product or food item that they sold, or donated a percentage of their sales. Altogether this amounted to about 22.600 Euros. A list of the participating companies can be found on our homepage. Alchemilla, Konditorei Alex, Hotel am Brunnen, AutoSigi Covi, Bikeshop Engl, Boutique Mareny, Carpe Vitam, Die neue Südtiroler Tageszeitung, Dogat Paradies für Haustiere Bozen, Dogat Paradies für Haustiere Meran, Enovit Vinoteque, Filmclub Bozen, Granel, Galerie Hofburg – Kompatscher, Hotel Grüner Baum Stremitzer, Hotel Restaurant & Bar Laurin, Hotel Restaurant Schönblick – Belvedere, Raststätte Lanz, Elektro Lutz, Nordwal Colors Auer, Nordwal Colors Bozen, Nordwal Colors Bruneck, Nordwal Colors Meran, Nordwal Colors Trient, Northland Store Brixen, Northland Store Bozen, Despar Pircher, Reform Natura, Restaurant Finsterwirt, Restaurant Zum Turm, Immobilien Sader, Metzgerei Schanung, Gärtnerei Schullian, Süßwaren Seebacher, Pizzeria Trametsch, Triade SuperBio Bozen, Triade SuperBio Kaltern, Triade Super-Bio Neumarkt, Weinschenke Vineria Paradeis, Vitalis Dr. Joseph, Voodoo Store, Druckerei Weger, Weingalerie, WeWa Markt, Gardencenter Winkler. Soup Sundays were organized for us by the Katholischer Familienverband in Tiers. We were able to collect 1.500 Euro for “yummy! Meals for schools” and for our Rays of Hope schools. Thanks! The organizers of the following events took the chance to collect donations for us: Rock in Dusty Valley, the birthday celebration of Zeno Kerschbaumer, birthday celebration of Christoph Tscholl, summer festival of Mr. Hellweger, August flea market, Mütterrunde Brixen and the Prom party of the Franziskanergymnasium. We are very thankful for this support. We received a total of over 18.850 Euro donations. 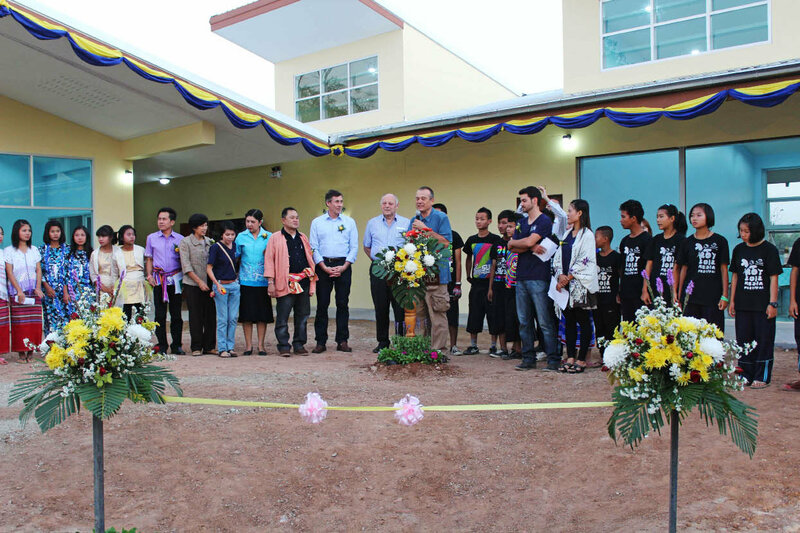 The four volunteers from Vinschgau, Hannah Bernhard, Alexander Stecher, Thomas Öggl and Klaus Zoderer, who spent some time with us in Mae Sot last year, decided to organize the second edition of their ‘Week of Hope’ festival in Schlanders. From presentations, a photo exhibition and the charity concert, they collected 1.100 Euro. The famous children’s books author Pia Pedevilla organized handicraft courses for the teachers of the “Goller” primary school. Together with the students they did handicrafts which they sold at the Christmas market of the school and collected 2.650 Euros. This year we printed Christmas cards again, designed partly by South Tyrolean artists. This year we got new motifs from Gaspare Bruccoleri, Claudio Olivotto, Martin Rainer and Pia Pedevilla. We thank the company Wolf Windows, especially Sonja Wild, who has been doing the management, including delivery and accounting since many years. We also thank the printing company Weger for their help. We managed to sell a total of 8.253 cards. The South Tyrolean Youth Symphony orchestra, under the direction of Stephen Lloyd, has been supporting the music project of our „Rays of Youth“ team since three years. During their two closing concerts donations were collected. We are thankful for approx. 3.200 Euro. Under the direction of Bruno Gius, the Auludis Gospel Choir celebrated its 20-year anniversary and for the third time collected donations for the refugees from Burma. The event was a huge success and we received 1.100 Euros. The event Musical School 2012, organized by the youth centre “Papperlapapp” took place in Bozen. The students from the Musical School donated 1 Euro from every entry ticket and this way managed to collect 750 Euros. The music class in the Fritz Ebner Middle School in Schlanders collected donations for us during their Christmas concert and the amount came to 2.300 Euro for our Ray of Hope Schools. The childrens carnival was organized by Stadtmarketing Bruneck, together with other organizations, which take care of children. All donations, altogether over 1.600 Euro, were given to our organization. The students of the Bruneck vocational school also took part and gave make-up tips. All together we had 23 people volunteering for us in Mae Sot, 10 of them came from South Tyrol. On top of this, we had 16 visitors from 5 countries. In the last year we invested 576.132 Euro in our projects, this is 134.537 Euro less than the year before. Last year we supported 12 schools with approx. 2.348 students on both sides of the border, as well as 6 dormitories with 270 students. Additionally, we supported other schools with stationery or small amounts of money to overcome their funding shortages. 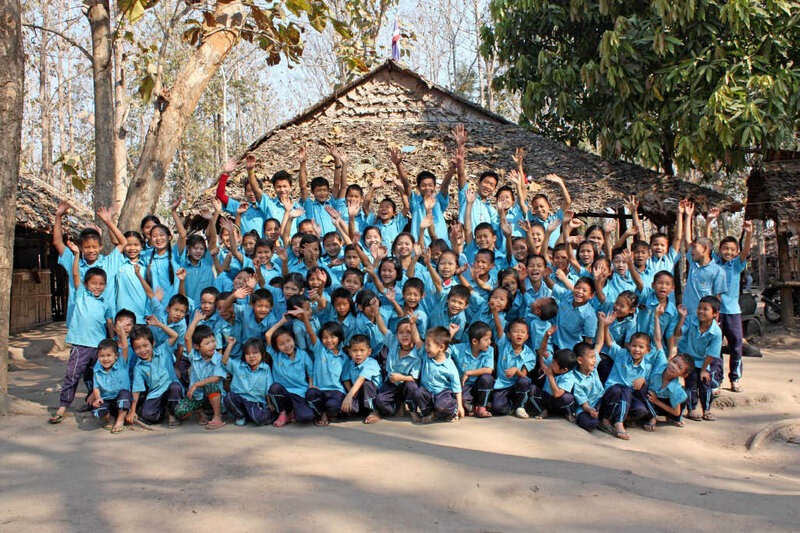 „Ray of Hope“ Schools in Thailand: Our 8 Ray of Hope schools are fully supported by us. We buy and distribute all school materials at the beginning of the academic year for 2.153 students and 110 teachers. We hold monthly meetings with all the school directors to solve problems and discuss common projects. This is also when the teachers’ salaries are given out, and the bills for that month are submitted and checked. Unfortunately, at the beginning of the school year 2012/2013 the budget had to be reduced, due to the fact that we were receiving less donations. Therefore, the students’ parents agreed to cover part of the transport costs. As in previous years, all students and teachers received ID cards with pictures, to protect them from arrest and deportation. During the May school break we organized a training for our school bus drivers, to improve the safety of the children. In August Nay Chilin, our school projects assistant, started to work with us. The amount of work connected with this project made it necessary to take on a new employee. At the end of the year we were supporting 3 schools with 5 teachers and 125 students. In September the Hser Poe Hta school was closed, since the village was only temporary. The people living there returned home, because since the situation had become more stable. We continue to support the Pah Bu Hla Hta and Kaw Poe Khee schools, as well as the Pah Bu Hla Hta kindergarten. Dormitories: Our 6 dormitories are financed completely, including food (either from our kitchen or in the form of food supplies, in case the delivery is too expensive). One dormitory is in Mae La Refugee Camp, one on the order in Umphang and four others form part of our Rays of Hope schools. In cooperation with Save the Children UK we organize trainings for dormitory care takers, to improve the situation in the dormitories and especially the assistance of the students, most of them traumatized and in need of skilled care takers. Some of our schools, dormitories and Rays of Youth are being financed, sometimes since many years, by many single donors and the following project adopters: ACS Data Systems AG, Augschöll Johann, Camping Seiser Alm, Capito Caroline, Olivia Guevara, Hope 4 the World, Youth Symphonic Orchestra South Tyrol, Kerschbaumer Zeno, Kunstdünger GmbH, Eine Weltgruppe Lajen, Nonna Gabriella, Nordwal AG, Axel & Sabine Senftleben, Technologische Fachoberschule Fallmerayer, Bäckerei Trocker, Wendelgard Lageder Projekt, Wolf Fenster AG. Trainings and events: As in previous years, we also offered different training courses and workshops this year. We took part in different celebrations like World Childrens Day or Womens Day. In February Eva Benelli did pottery with our Rays of Youth. In the meantime the Rays of Youth team took over the organization of a lot of the training events. More information can be found under the Rays of Youth section. Rays of Youth: There are four young people in the team. Unfortunately, Eh Mwe and Pher Chay left us due to personal reasons. Pawk Htun joined us instead. The two main projects are the training of the ‘Peer Youth’ and the music training. The team also conducted various workshops. 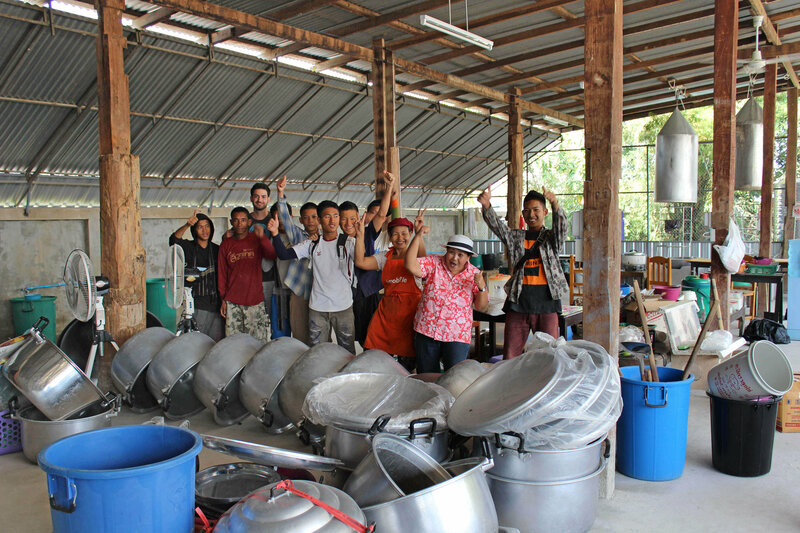 In the meantime the Rays of Youth team has become well known for their work also outside the borders of Mae Sot. The building of the new Rays of Youth centre began in June and was completed in January 2013. Apart from a meeting room, the building has enough space for playing music, learning and also sleeping. We would like to thank Stiftung Swiss Seaside, Mr. Reinhard Plank, the Region Trentino-Südtirol and the Stiftung Südtiroler Sparkasse for financing the building. In 2012 we invested 184.786 Euro or 32,1% of the total expenses in schools and education projects. Prosthetic department Mae Tao Clinic: We have been supporting this project with contributions of the “Land Südtirol –Amt für Kabinettsangelegenheiten” since 2003. We are paying for all the materials to make prosthesis, as well as dressings, disinfectants, anaesthetics, part of the medicine and instruments, etc. Last year 289 amputees, mainly mine victims, received a new prosthesis. Acupuncture department Mae Tao Clinic: Since 2011 we also support the Acupuncture department, which was established by the German Doctor Ulrich Hühne at the end of 2011. In 2012 a total of 4.417 patients were treated. The achievements of the acupuncture team got around quickly. The successes in the treatment of sciatica, migraine, paralysis after strokes, Parkinsons and the reduction of medicine usage with chronic illnesses are sensational. Kathi Zeschg Clinic: This clinic is still offering only basic services and only a limited number of patients can be taken in, due to the difficult situation. In 2012 the clinic took care of 6.398 patients, 2.525 of those were under the age of five. We buy and deliver all supplies directly. We would like to thank the Family Zeschg, their friends and relatives for their long time support in remembrance of their daughter Kathi. In 2012 we invested 37.511 Euro or 6,5% of our overall expenses in our medical projects. „The Happy Tailor“ – Sewing Workshop: Most of the work of our sewing workshop was taken up by making school uniforms, even though they received more and more external orders. In 2012 the sewing workshop produced a total of 10.824 pieces of clothing, amongst them 2.264 free uniform sets for our Rays of Hope schools. The Happy Tailor also took on external work from other organizations or small fashion firms and managed an income of 6.250 Euros, which will go back into the project. The economic crisis also affected our sewing workshop, and we decided not to hire any new employees or replace any who have left. At the end of the year we had 5 people employed in the sewing workshop. At the end of the year the kitchen and sewing workshop moved into their new building. We thank the Maro Foundation for their support. In 2012 we spent 16.531 Euro or 2,9% of the total expenses in our programme for community and income generation. yummy! – meals for schools: 2012 was a difficult year for the Yummy!- meals for schools project. Due to a lack of finances we had to completely stop the Fruit and milk programme in March and also reduce the number of meals delivered to schools. In 2011 we started to ask for 2 cents per meal from the parents who could afford it. In 2012 this sum was increased to 5 cents. 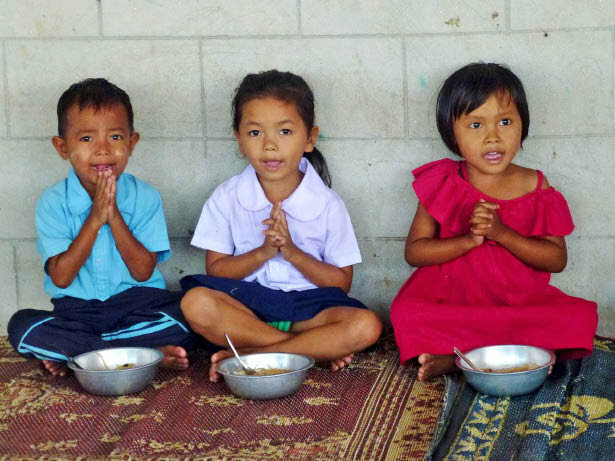 At the end of the year we had provided up to 668.016 (2011: 989.813) healthy and varied meals to 12 schools and 7 dormitories in the greater Mae Sot area. Despite a reduction in donations and an increase in the price of food products, we managed to keep the cost of one meal at 30 cents (including all costs and the delivery). Our kitchen catered for 21.682 meals from external orders, which was around 3.000 more than the year before. For our Rays of Youth Media Festival in November the team cooked for 400 guests. Last year we started looking for a new building for our kitchen. It was necessary to move, since we were receiving complaints from local residents about the noise and smell from the kitchen. In the end we found a building, which after renovation was suitable for both the kitchen and sewing workshop. And at the start of 2013 we could finally move there. Programme „Fruit and Milk“: From January to March we delivered a total of 32.082 portions of Fruit and Milk. Due to the reduction in donations we were forced to discontinue this project after the end of the school year. We could not finance this project in the 2012/2013 school year, since we had to ensure we had the finances to cover the daily meals instead. Emergency: In February there was a fire at Umphiem refugee camp, 80 kms south of Mae Sot. More than 1.000 homes were ruined, and over 4.000 people left without a roof over their head. 566 houses were completely destroyed, a further 515 houses needed a new roof. We reacted quickly and together with Save the Children UK and Catholic Office for Emergency Relief and Refugees, provided the people with basic necessities. In the same month there was a fire South of Mae Sot, at KM44, this time from a cooking area that was not attended to. Some of our KM42 students were also affected. In only 45 minutes the whole village burned down and left 31 families homeless. Together with the Spanish organization ‘Colabora Birmania’ and SPARK Circus we could give the people necessary supplies and help them rebuild their homes. We would like to thank, besides all the single donors, especially the following project adopters and donors for the financial support to this project, often over many years: Amt für humanitäre Hilfe (Region Trentino South Tyrol), Bischöfliches Ordinariat (Missio-Sternsinger) , Amt für Kabinettsangelegenheiten (Land South Tyrol), Maro Foundation and Costanza Merzagora-Piatti. In 2012 we invested 186.555 Euro or 32,4% of our total expenses in our food and agriculture projects. All projects are taken care of by our team in Mae Sot. The staff there are in contact with all the other Help without Frontiers country branches, as well as with local government and non-government organizations. All materials for schools, dormitories, prosthetic department, kitchen, sewing workshop etc. have to be bought, allocated and delivered. Student and emergency medical transport have to be organized, as well as the delivery of all materials, meals, fruit and milk. The projects are being visited regularly, monitored and analyzed. From the start of 2013 we have the Rays of Youth centre next to our office and so there is more space for meetings and various events. In 2012 we invested 150.045 Euro of the total expense in our project assistance, from which 79.450 Euros for the building of the new youth centre, for the renovation of the new kitchen and the purchase of a vehicle. The net expense for project assistance in 2012 came to 70.595 Euro or 12,3%.